I’m chuffed to be hosting a couple of composer conversations at EXAUDI‘s next concert, on 4 May at the Only Connect Theatre, Cubitt Street, King’s Cross. Before the music starts I’ll be on stage talking with Matthew Shlomowitz and EXAUDI’s director James Weeks, and about midway through I’ll be hosting a roundtable discussion with Shlomowitz, Weeks, Aaron Cassidy, Stephen Chase and Claudia Molitor. A shedload of talent, moderated by a fool. I’m not the reason you should go. You actually want to see EXAUDI themselves, who will be singing pieces by Shlomowitz, Weeks, Cassidy, Chase and Evan Johnson. 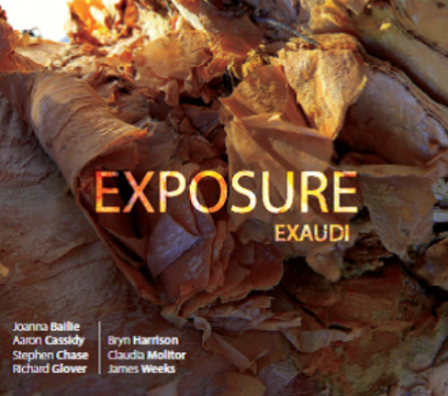 They’ll also be launching their new CD, Exposure – the sixth release from Huddersfield Contemporary Recordings. I’ve been listening to it lots over the weekend, and it’s pretty special. It features pieces by Cassidy, Weeks, Chase, Molitor, Bryn Harrison, Richard Glover and Joanna Bailie. A really diverse mix, but somehow, and thanks to EXAUDI’s alchemical powers, a coherent one. Really beautiful too. The concert should be great as well; get down to King’s Cross if you can.